The word government is sometimes used to describe the executive alone. However, when the government of the UK is mentioned in constitutional law, it includes the three organs of power, namely the legislature, executive and judiciary. For discussion about the judiciary, see Part I of this guide. Both meanings of the word government is used in this part of the Guide. In this section the legislature and executive and the Monarch (which has a role in both) will be discussed in more detail. The UK Government as executive is known as 'Her Majesty's Government' (HMG). The Monarch's executive roles are carried out by her Minister's and she also has a role in the legislative function. The UK Government is sometimes also known as the 'executive' because it is the part of the British system that is responsible for carrying out or executing the laws of the country. Government in this sense is like the management of the country. It is made up of the different Departments run by Ministers and is headed by the Prime Minister. The executive function of government is formed by the party that gains the most seats in the House of Commons at a General Election. The leader of that party becomes the Prime Minister. The Prime Minister selects the members of the Government from Members of Parliament (MP's), Peers and very occasionally senior people outside Parliament. This means that constitutional law involves politics as well as law. The party system and voters are an important part of the process. In theory the Queen is the head of the Executive, but in practice the real power is exercised by the Prime Minister. This is why the UK is known as a 'constitutional monarchy' in that virtually all the Monarch's powers are exercised by her Ministers. The Executive therefore consists of the Queen, the Prime Minister, the Cabinet, other Government Ministers and, as it carries out the day-to-day running of the country, the Civil Service. The civil service and the armed forces perform executive functions and are controlled directly by central government. Other bodies that have executive functions, but are not controlled day-to-day by central government, are the police and local authorities. Also, British membership into the EU has meant that the European Council and Commission now exercise executive functions in relation to the United Kingdom. However, even though the executive may have residual duties, this does not mean that is not powerful, for it has control of the day-today running of the state. The executive function of Government does not make laws in the UK (although it does assent to laws in Europe). The executive can make delegated legislation (Statutory Instruments) but this is delegated legislative power that generally comes from statute (a 'parent Act'). Delegated legislation, unlike Acts of Parliament, can be challenged in a court of law. Some powers of delegation, however, come from the Royal prerogative powers (but see The Parliamentary Control of the Executive Bill in Part I of this Guide. It is a Bill that demonstrates that the so-called 'Royal' Prerogatives are, in reality, no such thing; Parliament being free to make them into parliamentary prerogatives). The Queen in Parliament, which includes both Houses of Parliament and the Monarch, makes laws. The Government can propose new laws in the form of Bills which it presents to Parliament for consideration. In practice, because the Government is formed from the largest party, the laws that it proposes are usually agreed by Parliament. As already mentioned above, the legislature in the UK is the Queen in Parliament. 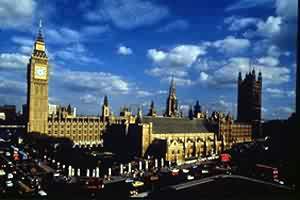 The two Houses of Parliament are the important buildings of the legislative function government. Most of the information regarding Parliament has been resourced from the official UK Parliament website. The information here appears courtesy of the webmaster of that site. A picture of Westminster Palace, which holds the buildings of Parliament, the House of Commons and the House of Lords. The Royal Palace dates back to 1099. The Palace is owned by the Crown and is managed by the government on its behalf. On the Parliament website you can find out about the work of the two Houses, their members and their committees, as well as accessing contact details and publications. You can find further information on the How Parliament Works page. This guide does not enter into the work of Parliament in great detail. It focuses more on the function and description of Parliament. Some of the links in the text below link to external Parliament sites. If not expressly mentioned, then these links are in white. To return to ACL and to this Guide, just click on the back button of your browser. If you are using ACL's own full screen gold browser just right click your mouse when you are on the Parliamentary website and select 'back' from the options to return here. The Introduction to Parliament section offers a brief guide to the history, role and procedure of the UK Parliament. It also provides links to some other resources that are available on the Parliamentary Website, from which the majority of this information has been collected. William the Conqueror having established his first stronghold at the Tower of London later moved to the Palace of Westminster. It is from the reign of his son William Rufus that the first buildings on this site date, including Westminster Hall which was built at the Northern end of the Palace and still stands today after 900 years of continuous use. The existence of this Hall helped to make Westminster the ceremonial centre of the Kingdom. The Palace was one of the Monarch’s principal homes throughout the Middle Ages and for this reason the institutions of Government came to be clustered in this area. Following a fire in 1834 the new Palace was begun and finished by 1870. It is in the Gothic style which makes it look older than it really is. It was designed by Charles Barry and the interiors were decorated by Augustus Pugin. As can be seen from the picture above, today the building is on four levels: housing offices, dining rooms, bars, meeting rooms, libraries and committee rooms. At either end are residences for the Speaker and the Lord Chancellor and there are two great Towers: the Clock Tower (on the left-hand side of the above picture, commonly known as Big Ben, the name given to the it's bell) and the Victoria Tower. Further information can be obtained from Factsheet G11 at the UK Parliament site. The UK Parliament is one of the oldest representative assemblies in the world, having its origins in the mid-13th Century. From the 14th Century, parliamentary government in the United Kingdom has been based on a two-chamber system. The House of Lords (the upper House) and the House of Commons (the lower house) sit separately and are constituted on entirely different principles. The relationship between the two Houses is governed largely by convention but is in part defined by the Parliament Acts. The legislative process involves both Houses of Parliament and the Monarch. Even though the House of Lords is known as the upper House, as is can be seen further down below in this part of the Guide, real legislative power lies with the House of Commons. debate the major issues of the day. Until the early years of the 20th century, the House of Lords had the power to prevent legislation, as bills had to be passed by both Houses of Parliament. David Lloyd-George's so-called 'people's budget' of 1909 brought this arrangement under strain, when the House of Lords originally refused to pass it. Eventually, the budget was passed after a general election in 1910; a second election was then fought on the issue of reform of the House of Lords. The result was the Parliament Act of 1911, which removed from the House of Lords the power to veto a bill, except one to prolong the lifetime of a parliament. Instead, the Lords could delay a bill by up to two years. The Act also reduced the maximum lifespan of a Parliament from seven years to its present five years. The Parliament Act 1949 further reduced the Lords' delaying powers to one year. As mentioned, a Parliament can last up to five years but after that time there must be a General Election. The Prime Minister can call an election before the five years are over. Dissolution is the official term for the end of a Parliament. The Prime Minister may call a General Election before this date (before the period of five years), but at the end of the Parliament he or she asks the Monarch to grant a Dissolution. Parliament is dissolved by Royal Proclamation. The life of a Parliament is divided into sessions, normally of one year each, which are ended when Parliament is prorogued (also under the prerogative) by a royal commission. Each House divides a session into sittings, normally of a day's duration, which end when a motion for adjournment is passed. For more about prerogatives, click here. There are devolved Parliaments/Assemblies in Scotland, Wales and Northern Ireland created by legislation passed by the UK Parliament. Click on the links to go to the appropriate websites for them. The Chamber in which the Lords meet to debate is also the culminating point of the Royal Procession to open Parliament. It is within this magnificent setting that members of the House of Lords meet to hold general debates, put questions to ministers, and consider legislation, although their power over this is limited. To see a panoramic view of the inside of the House of Lords, please click here. Quicktime is necessary for viewing. 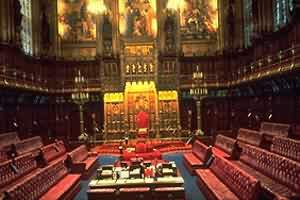 The House of Lords Chamber was designed by Charles Barry and Augustus Pugin after the fire of 1834. It is a very beautiful and ornate room decorated in red and gold. At each end of the Chamber, there are three frescos representing Religion, Justice and Chivalry. The Layout of the Chamber consists of red benches on three sides of the Chamber. There is a table in the middle and at one end there is the Throne and the Woolsack. The Woolsack is the seat of the Lord Chancellor in the House of Lords. It is a large square cushion of wool covered in red cloth. It has no arms or back. The tradition of the Woolsack dates back to the reign of Edward III. At that time the wool trade was one of the most important parts of the economy. A seat stuffed with wool was therefore a very important symbol of the wealth of the country. For a time the Woolsack was stuffed with horse hair but today it is again stuffed with wool brought from around the Commonwealth. Legislation is a major function of the House of Lords. It spends about two thirds of its time revising Bills sent from the House of Commons. Indeed it is often referred to as a 'revising chamber'. It is also known as the Upper House. The House is presided over by the Lord Chancellor. The House of Lords also acts as a check on the Government and is a forum for debates on topics of the day. The Lords has judicial as well as parliamentary functions. It is also the ultimate Court of Appeal. q The House used to consist of 1,200 temporal and 26 spiritual Lords of Parliament. Of the Lords Temporal just under 800 were hereditary peers, but since the House of Lords Act 1999, the number of hereditary peers has been reduced to 92. So now, the House consists of 526 temporal and 26 spiritual Lords of Parliament. o Lords of Appeal (not more than 11, 12 with the Lord Chancellor) appointed by the Crown. Law Lords retain membership of the House for life so at present the number of Law Lords in the House is 26. A Peer is someone who is a Baron, Duke, Earl or Marquis. Some titles are Hereditary but most Barons are Life Peers. Life Peers and some Hereditary Peers are entitled to sit in the House of Lords. Hereditary peers inherit their title. The House of Lords Act 1999 removed the entitlement of most of the hereditary peers to sit and vote in the House of Lords and of the 92 hereditary peers who retain their seat in the Lords, 75 were elected by their fellow hereditary peers. The Peerage consists of five ranks, Duke, Marquess, Earl, Viscount and Baron. Peerages may become extinct or fall into abeyance, but so long as there is an heir the title will continue. A Life Peer differs from a Hereditary Peer in that the receiver cannot pass the title on to his or her children. Although Life Peers are appointed by the Queen, it is the Prime Minister who nominates them. By convention the Leader of the Opposition and other party leaders can propose a certain number. Also known as Law Lords, consists of up to 11 persons, (12 with the Lord Chancellor) holders of high judicial office or practising barristers of at least 15 years' standing, who are appointed to life peerages under the Appellate Jurisdiction Act 1876 to carry out the judicial function of the House of Lords. While full members of the upper chamber, the Law Lords normally (by convention) avoid participating in the most politically controversial business of the House. Membership is for life so the number of Law Lords sitting (including retired Law Lords) is 26. The Parliament Act of 1911 was an Act introduced by the Liberal Party which reformed Parliament, and the House of Lords in particular, in a number of ways. It deprived the House of Lords of any powers over Money Bills. It gave the Speaker the power to decide what was a Money Bill. It allowed Bills that had been passed by the Commons in three successive sessions, but rejected by the Lords in all three, to become Law. It reduced the life of a Parliament to five years. The progress of the Act through Parliament was a difficult one because the House of Lords were opposed to anything that reduced their powers, yet, in order for the proposals to become law the House of Lords had to agree to them. The King at the time, George V, tried unsuccessfully to settle the matter by discussion between the Liberal and Conservative leaders. Finally George V agreed to create enough Liberal Peers who would support the Bill in the House of Lords provided he could be sure that the reform was what the electorate wanted. There was, therefore, a General Election in December 1910. The Bill was eventually passed by 131 votes to 114 by a House of Lords that prefered to lose some of its powers rather than see 250 new Liberal Peers created. From this time the House of Lords had no control over the financial proposals of the Commons and could only hold up other legislation for two years. However this meant that the Lords could prevent the passage of Bills during the last two years of a Parliament. The Parliament Act 1949 further reduced the Lords' delaying powers to one year. The Life Peerages Act 1958 was a significant reform that affected the House of Lords. The Act allowed both men and, for the first time, women to sit and vote in the House of Lords for their lifetime only. The Life Peerages Act altered the composition of the House of Lords because it introduced more people from different professions, and more women. Before the Act the House of Lords had been made up exclusively of Hereditary Peers, who were usually men from a narrow section of the population. The House of Lords Act 1999 removed the entitlement of most of the hereditary peers to sit and vote in the House of Lords and of the 92 hereditary peers who retain their seat in the Lords, 75 were elected by their fellow hereditary peers. The Peerage consists of five ranks, Duke, Marquess, Earl, Viscount and Baron. Peerages may become extinct or fall into abeyance, but so long as there is an heir the title will continue. The Chamber of the House of Commons is where Britain's elected representatives meet to debate. It was redesigned after the Second World War by Giles Gilbert Scott on almost exactly the same plan as that devised by Charles Barry in the nineteenth century. The shape of the room derives from that of the Chapel of St Stephen, which was for centuries the home of the Commons, until the fire of 1834. To see a panoramic view of the inside of the House of Commons, please click here. Quicktime is necessary for viewing. The House of Commons Chamber was rebuilt by Sir Giles Gilbert Scott after it was damaged during the Second World War. The new Chamber was built in a style that was in keeping with the Chamber that had been destroyed. The layout of the Chamber consists of two sets of green benches that are opposite to each other. There is a table in the middle and the Speaker's Chair at one end. This arrangement means that the Government and Opposition MPs sit facing each other. The Chamber is actually quite small as there is only room for 437 MPs to sit down when there are 659 MPs in total. Many of the objects in the Chamber, such as the Speaker's Chair, are gifts from Commonwealth countries. The Speaker is an MP who has been elected to act as Chairman during debates in the House of Commons. He or she is responsible for ensuring that the rules laid down by the House for the carrying out of its business are observed. It is the Speaker who calls MPs to speak, and maintains order in the House. He or she acts as the House's representative in its relations with outside bodies and the other elements of Parliament such as the Lords and the Monarch. The Speaker is also responsible for protecting the interests of minorities in the House. He or she must ensure that the holders of an opinion, however unpopular, are allowed to put across their view without undue obstruction. It is also the Speaker who reprimands, on behalf of the House, an MP brought to the Bar of the House. In the case of disobedience the Speaker can 'name' an MP which results in their suspension from the House for a period. The Speaker must be impartial in all matters. He or she is elected by MPs in the House of Commons but then ceases to be involved in party politics. All sides in the House rely on the Speaker's disinterest. Even after retirement a former Speaker will not take part in political issues. Taking on the office means losing close contact with old colleagues and keeping apart from all groups and interests, even avoiding using the House of Commons dining rooms or bars. The Speaker continues as a Member of Parliament dealing with constituent's letters and problems. By tradition other candidates from the major parties do not contest the Speaker's seat at a General Election. The Speakership dates back to 1377 when Sir Thomas Hungerford was appointed to the role. The title Speaker comes from the fact that the Speaker was the official spokesman of the House of Commons to the Monarch. In the early years of the office, several Speakers suffered violent deaths when they presented unwelcome news to the King. Further information can be obtained from Factsheet M2 at the UK Parliament site. There are 659 MP's elected on a constituency basis by those entitled to vote. A person convicted of an offence and sentenced to a term of imprisonment for more than one year - Representation of the People Act 1981. This covers imprisonment in the UK and the Republic of Ireland. A General Election is when the electors of the country cast their votes to elect Members of Parliament. The Parliament Act 1911 established the maximum life of a Parliament, that is the time between General Elections, as 5 years. The reasons for calling a General Election on a specific date are varied, but generally stem from a Government's desire to obtain a further or increased majority in the House of Commons for the next five years - to have a further five years in power. A government cannot operate effectively unless it can command the support of the majority of MPs within the House of Commons. Should it fail to hold the confidence of the majority of the House, it has to call a General Election. Once dissolution has been announced, the Clerk of the Crown in Chancery issues Writs of Election. At this time the date of meeting for the new Parliament will also be announced. 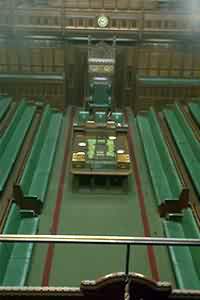 Although the Government continues in office, there cease to be any MPs and former Members may not use the facilities of the House whilst the General Election is in progress. At the beginning of a new Parliament the Clerk of the Crown in Chancery will deliver to the Clerk of the House a return book, which lists the members who won constituency seats and therefore have the right to serve in Parliament. Further information can be obtained from Factsheet M15 at the UK Parliament site. The Electoral Register is a list of all the people who are eligible to vote and have registered to do so. The Electoral Register for each constituency is revised monthly. Registration is a statutory obligation but, in practice, not everyone registers. Those who do not register cannot vote in elections. Electoral Registers are available, for reference only, in public libraries and local authority offices. Those eligible to vote are held in the Representation of the People Act 1983-2000. Political Parties are formed by groups of people who are united in maintaining a set of policies. They have similar ideas on how the nation should be governed and band together to achieve that view. In Britain the party system has evolved from the historical division of Whigs and Tories in the Stuart period. The Tories were the representatives of the Monarchy and Anglicanism and the Whigs were the aristocratic party of foreign expansion. Under Gladstone the Whigs became the Liberal Party. In the early decades of the 20th Century the Liberal Party was pledged to social reform whilst the Conservatives stood more for the preservation of vested interests and tariff reform. The growth of the Labour Party led to the decline of the Liberals in the first part of the twentieth century but, since the 1970s, there have been increasing numbers of parties represented in the House of Commons. While Labour and Conservative have remained the largest parties, the Liberal Democrats have increased their strength, there are MPs from nationalist parties in Scotland and Wales and a number of Northern Ireland parties. * a party can actually win a General Election with fewer seats than its opponents, as happened in February 1974. A 'safe seat' is one which remains in the hands of one party at every election, with the M.P. assured of re-election. It is estimated that some 60 % of the 651 seats are 'safe'. Such seats come about due to geographical considerations i.e. an industrial town will probably elect a Labour M.P. while a wealthy middle-class area will probably vote Conservative. Only in the event of a by-election due to the death or resignation of a M.P. is the notion of a 'safe seat' reduced. After their 1992 general Election success the Conservatives have failed to win ANY by-election victories, including severe defeats in formerly rock-solid Tory seats such as Eastleigh (1994) and Christchurch (1993). Safe seats are a worrying part of the British system because they mean that voters have very little influence over the final result. Only in 'marginal' seats where the outcome is less sure does the voter have a real say, but marginal seats are a minority. The two main parties enjoy concentrated support in certain areas, whereas the Liberal Democrat support is spread all over the country. In the 1992 General Election, the Conservatives won 161 seats in the South of England compared to 10 won by the Labour Party. Equally, in the North of England the Labour Party won 107 seats compared to 53 won by the Tories. A tactical vote is one cast by the voter not for his preferred party but for another he feels has a better chance of winning. This is usually done to keep out another candidate. Typically, this might be a Liberal Democratic voter supporting the Conservatives because he knows that the Liberal Democrat cannot win and he does not wish to see the Labour candidate win. Tactical voting may occur because the voter does nit wish to waste his vote and because their is no second choice in the British voting system. Tactical voting does not always hinder the smaller parties, especially in by-elections when recent trends have shown that Labour voters will switch allegiance to the Liberal Democrats to defeat the Tories. However such tactical voting often lessens during General Election times. The most important feature of the British electoral system is that it produces a decisive outcome leading to strong single-party government. Every election since the Second World War (1945) has produced a majority government - except in February 1974. ADVANTAGES OF THE 'FIRST-PAST-THE-POST' SYSTEM : n.b. this system should considered in light of its use in the 2-party system of Britain. * there is a strong traditional link between British M.P. 's and their constituents, safeguarded by the single-member constituents. * while constituencies M.P. 's are a strength, some may prefer to a M.P. of their own party. The first ballot is a vote along British lines. However the candidate must gain 50 % +1 of the vote to be elected. If this is not achieved a second ballot is held at a later date. There will be 2 final candidates and voters are free to chose who to vote for. The winner is guaranteed a 50 % +1 majority. his is the system used in France. This variation of the 'second ballot' system is used in Australia. Each voter makes a first and second choice on the ballot paper. First choices are added together and any candidate with over 50 % of the vote is elected. If this is not achieved the second choices are added to the scores of the top 2 candidates so that an overall majority must be achieved by one of them. Essentially, it is like the 'second ballot' system carried out on one day. This simple system operates in Israel, Holland, Belgium, Spain and Portugal. There are no constituencies and voters choose a party not a candidate. The proportion of each party votes are calculated and the parties are awarded the same proportion of seats as votes won. Thus, 40 % votes = 40 % seats. It is up to the parties who fill the seats, though a party list is usually drawn up before the election. A 'threshold' may be stipulated whereby there is a minimum amount of votes (usually 5 %) a party must win before they can claim seats. The threshold is lower in Israel, which is notorious for awarding seats to tiny extremist parties. This is the most popular choice of those who wish to change the present system in Britain. It is used in the Republic of Ireland and in Northern Ireland for European Elections. It is considered to be a difficult system to understand. - candidates with the fewest votes are eliminated and their second preference votes are transferred to the remaining candidates. If any candidate now has reached the quota he is elected. - the process continues until the required number of candidates have reached the quota. While by no means straight forward, the counting is left to the Returning Officer and it allows the voter to choose between candidates and parties. This section provides some very brief information about the concepts of power and politics as background to what is discussed in this part of the Guide. ALL states exercise power over their citizens, but the level of power that is used can vary from 'total' power to much lower levels of power. Similarly, if a state needs to force an issue, it can fall back on the use of coercion ie. the use of force. QUESTION : HOW MIGHT AN INDIVIDUAL PROTEST AGAINST A TOTALITARIAN REGIME ? Yet not all states are totalitarian or need to resort to such political tactics. This is usually because their citizens give their consent to be governed. Why then do people conform and accept the laws and rulings of those power ? (iv) fear of punishment if they go against the regime. A truly democratic government / society can point that its government is elected by the people, but even this form of power has had its critics. With elections in the United Kingdom only held every 4/5 years, do the public really have a say. Lord Hailsham's notion this was of an "...elected dictatorship." In other words, the British government has power because it has been elected but arguably once in power it can do what it likes ! The problems begin for any government when a section of its citizens withdraw support for the government. In the UK this can be seen with the Northern Ireland issue. Thus we are faced with a variety of different types of political power from totalitarianism to liberal-democracies. The question is which is or should be the most 'natural' form of government. The main question of who has power and who has not is an ever changing according to the society and circumstances in question. Political power may come from outside government as well eg. (i)TRADE UNIONS : In the 1970's the Trade Unions in the UK had very close links with the Labour Government, with the saying that they had 'beer and sandwiches' with Prime Minister Harold Wilson (1964 - 70 and 1974 - 76) and influenced his economic policy. (ii)'BIG BUSINESS': In the UK, they have close links with the Conservatives, with many Tory M.P. 's on the Boards of companies. The Prime Minister is the leader of the Government. He or she is the leader of the party that wins the most seats at a General Election. After a General Election, the Queen calls upon the leader of the largest party to form the Government. The Prime Minister chooses the other members of the Government and has a residence and offices at 10 Downing Street. In Parliament, the Prime Minister sits on the Government Front Bench near the Despatch Box in the House of Commons. He or she is also an MP. The Prime Minister has powers to appoint judges, create Life Peers and make appointments to senior positions in the Church of England. The PM also controls the Cabinet by determining the Cabinet agenda, sacking, reshuffling or appointing Ministers. Other members of the Government are appointed by the PM. The position of Prime Minister does not constitutionally exist - the Prime Minister's actual title is First Lord of the Treasury. The Cabinet is made up of about twenty senior Ministers chosen by the Prime Minister. The Cabinet decides on government policy and co-ordinates the work of the different government departments. The Cabinet meets each week and also sets up smaller committees to look at certain issues. Cabinet meetings are private and its members should not disclose any information about them. There is also a Cabinet Office which is the central department of the Government. This department is responsible for ensuring that the Government can work efficiently and also manages the Civil Service. The Civil Service are the permanent administrative staff who work in Government Departments and carry out the policies of Government. In 2000 there were nearly 500,000 Civil Servants, 80% of whom work in Government Offices outside London. Members of the Civil Service are non-political in the sense that they work for the Government, whichever party forms it. The branch of the Civil Service that works in the Foreign Office and serves in British Embassies abroad is known as the Diplomatic Service. A Member of Parliament (MP) is elected by a particular area or constituency in Britain to represent them in the House of Commons. MPs divide their time between their constituency and the Houses of Parliament in London. Once elected it is an MP's job to represent all the people in his or her constituency. An MP can ask Government Ministers questions, speak about issues in the House of Commons and consider and propose new laws. To become an MP you have to win an election. Britain is divided into areas called constituencies, and one MP is elected to represent each of these areas. The size and number of constituencies are reviewed at intervals of between 8 and 12 years by the Boundary Commissioners and agreed by Parliament. In 2001 there were 659 constituencies in the United Kingdom of which 529 are in England, 40 are in Wales, 72 are in Scotland and 18 are in Northern Ireland. Ministers make up the Government and almost all are members of the House of Lords or the House of Commons. There are three main types of Minister. Departmental Ministers are in charge of Government Departments. The Government is divided into different Departments which have responsibilities for different areas. For example the Treasury is in charge of Government spending. 1. Departmental Ministers in the Cabinet are generally called 'Secretary of State' but some have special titles such as Chancellor of the Exchequer. 2. Ministers of State and 3. Junior Ministers assist the ministers in charge of the department. They normally have responsibility for a particular area within the department and are sometimes given a title that reflects this - for example Minister of Transport. For reports on ministerial responsibility and conduct see Scott and Nolan reports. The Treasury is the Government Department that looks at public spending and does the Government's accounting. It is responsible for overall Government spending on public services and for raising taxes. The Chancellor of the Exchequer is the principal Finance Minister of the Government. The Chancellor is the head of the Treasury and one of the most important members of the Cabinet. He is responsible for coordinating Government spending. His duties include preparing and presenting the Budget. The Budget statement is the annual estimate of revenue and expenditure presented by the Chancellor of the Exchequer to the House of Commons. Budgets are usually presented on Tuesdays, though they can occur on any day. Budgets are traditionally presented in the Spring but from 1993 to 1996 they were in November. One person who does have to take part in Parliament - whether they want to or not - is the reigning Monarch or Sovereign. This is because the institution we call Parliament has three elements - the Commons, the Lords and the Monarch. The Palace of Westminster is a Royal palace and everything that is done there is done in the Crown's name. It is a long time since a King or Queen actually had a direct say in law making, but the Monarch is the Head of State and gives the Royal Assent to all new legislation. The Monarch appoints Life Peers (on the Prime Minister’s advice), opens Parliament and dissolves it, and appoints the Prime Minister - though by convention the Monarch always appoints the leader of the party that won most seats in a General Election. The Royal Assent is the Monarch's agreement to make a Bill into an Act of Parliament. The Monarch actually has the right to refuse Royal Assent but nowadays this does not happen - the Royal Assent is a formality. The last time that the Royal Assent was refused was in 1708, when Queen Anne refused her Assent to a Bill for settling the Militia in Scotland. Privy Councillors are members of the Queen's own Council the 'Privy Council'. There are about five hundred members who have reached high public office. Membership includes all members of the Cabinet, past and present, the Speaker, the leaders of all major political parties, Archbishops and various senior judges as well as other senior public figures. Their role is to advise the Queen in carrying out her duties as Monarch. In the past Privy Councillors were the chief governing body and fulfilled the role that the Cabinet performs today. During debates in the Commons MPs who are Privy Councillors are referred to by their colleagues as `The Right Honourable Member'. Prerogative powers are ancient powers of the Crown and those powers relating to the legislative function of government are now exercised by Ministers. Legislation is not required where prerogative powers are exercised (primarily by Ministers) to pursue government policy (e.g the signing of foreign treaties, decisions on defence matters, granting pardons, etc). The prerogative will be superseded by statute. Where a statutory provision deals with the same area, the prerogative may be extinguished either expressly or by implication.